0 Comments Posted by Alyssa Noonan in General on Thursday, November 15th, 2018. When searching for the right care for their pets, potential clients will check out veterinarian websites before any other resources. Which is why you want to put thought into each element featured in your site. Don’t worry if you don’t know where to start, we’ve put together a guide to exactly what should be included in your veterinary website. In today’s online world, everyone prefers to have their tasks automated. This includes booking an appointment with their vet. Even if you have the nicest phone operators manning the front desk, there is just something seamless about being able to book your appointments online. Fortunately, there are a number of calendar platforms online that allow your customers to book their next appointment with the click of a button. Along with the ability to book their appointments online, customers love being able to fill out patient forms for their pets before ever entering your office. Not only does this keep them from having to arrive extra early, but it also helps them gather any extra information they may need. This especially comes in handy when dealing with things like surgeries, where the pet’s owner may be more emotional and not focused on things like forms. Blogs are a great marketing solution for any business for a number of reasons. First, if you use the right keywords in your blogs you can optimize your web page to increase your google search ranking. This makes it easier for potential customers to find you. Hosting a blog also demonstrates how knowledgeable you are on a variety of conditions, and can even be used to show the more emotional side of being a vet. Need help? 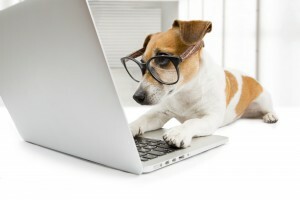 VetNetwork offers a custom blog service for veterinarians. One area that often goes forgotten are links to your social media. Remember, you want to include these links but it’s important to do so in the right way. You don’t want the links to be large or distracting because at the end of the day you don’t want anything to guide your audience away from your website. However, you want them to still be easy enough to find that they can follow you on social media and continue to build a strong rapport. If there’s anything animal lovers adore, it’s photos of other animals! Share the spotlight by dedicating a portion of your website to a patient gallery, pet owners will love the opportunity to show off their best friend. You can even have a “cat of the month” and “dog of the month” section that can be a great place to highlight regulars. Emails are still one of the best ways to market to your audience. Allowing your audience to opt-in to being added onto your email lists gives you the opportunity to continue marketing to them and staying relevant in their mind for when they need you the most. This means you can easily give them an update on specials or send them important information about health risks for their pet. You can even create a free infographic or worksheet to encourage them to sign up. Those considering your services want to know if they can trust you with one of the most important members of their family. Which is why it’s vital to include reviews and testimonials from other pet owners. The more reviews you can include the more transparency and trust you’ll earn, so don’t be afraid to ask your favorite customers if they’ll write a couple of brief sentences on your behalf. Using your part of your website to spotlight animals up for adoption not only helps you do good for the animal community but also shows potential customers that you walk to the walk. There’s a high likelihood that some of the people visiting your website are looking for a new pet, so you just might be able to help an animal in need without even trying! Have a favorite animal charity? Link up their donation form to your page so other animal lovers can get involved in helping. If you don’t want to ask for donations you can always link to a signature form on bills that fight animal abuse and testing. If someone is just encountering your veterinary services they will want to know exactly what you offer. Which is why it’s important to include a list of services where they can easily be found (and booked). Be sure to include a brief description under each service, in case the reader isn’t familiar with medical terminology. It’s also up to you whether or not you want to include pricing. Often new pet owners will want to know the best place to pick up pet supplies, best groomers, best sitters, and even best walkers. That’s why it’s so helpful to many of your patients to provide a list of references for your favorite pet-loving businesses. Not only does this help support businesses that you know treats animals well, but it also increases the chance that they will refer you in return. If you’re the only vet in you’re practice, you’ll want to include an about me page, discussing your education and experience. If you’re not the only vet in your practice, then we suggest including a vets page that gives you space to highlight each vet. The more information you can provide the more the reader will feel that you can be trusted with the health of their pet. You’re the best at giving animals the care they need, but building a website from scratch may not be up your alley. That’s why it’s great to work with a team that knows how to create premium veterinarian websites. If you’re ready to create your dream veterinary website contact us today so we can get started.